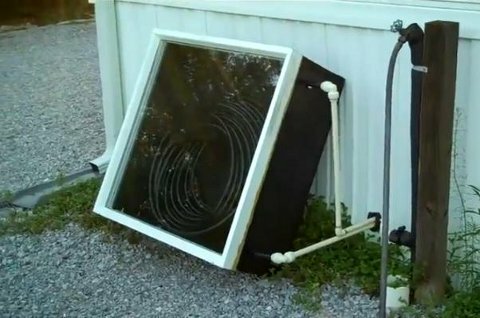 One of our forum members, TheyCallMeDave, recently built a PEX batch type solar hot water collector. Its a very simple design that is basically a black wooden box with a window and a coil of PEX tubing inside of it. The system does not have a tank or circulator pump, it runs the mains water right through the pex collector. The water in the tubing heats up during the day and provides hot water for Dave’s afternoon shower and occasional laundry or dishwasher use. The total cost for the entire setup was $350. See his video below for a run through of the system. Later, we’ll follow up with Dave to see how the solar collector is performing for him. As of right now, he is very happy with the new water heater. For additional information, see TheyCallMeDave’s forum thread.